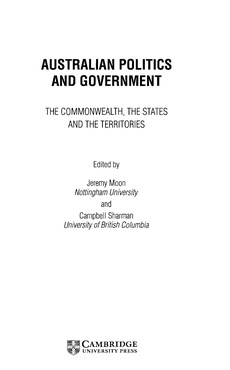 Copyright � 2003 Jeremy Moon and Campbell Sharman and Cambridge University Press. Tasmania's founding as a convict settlement in 1803 continues to shape the state's politics. Its convict origins gave rise to both a prominent role to the state which continues into the twenty-first century and, at the same time, a class divide and a determination on the part of the landed gentry to protect their interests. This latter feature was responsible for a constitutional design which stressed the importance of a property-based upper house of parliament as a conservative brake on government. The role of this chamber, the Legislative Council, although changed from its composition in 1856, has been to resist constitutional and democratic reform to itself, while permitting major changes to the lower house, the House of Assembly.